Mexican gray wolf M942, Brio, was born at the Endangered Wolf Center in Eureka, Missouri in 2005. 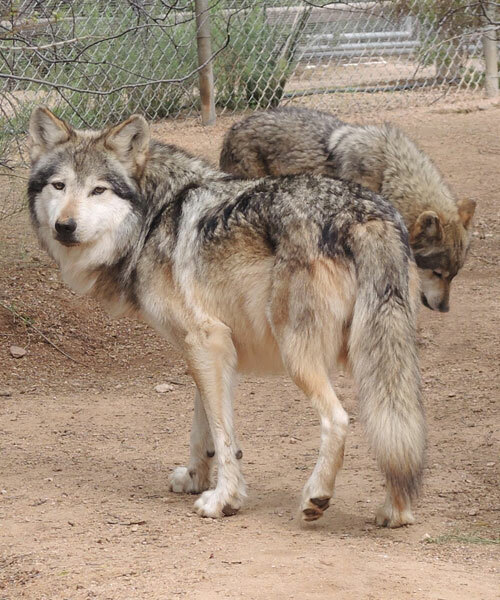 A very handsome wolf, Brio lives happily with shy Serenity, F883, in an enclosure off of Lobo Lane, where they're often busy napping or observing anyone walking down Lobo Lane. Brio is the brother of Himuti (M943), a Southwest Wildlife icon, who passed away a couple of years ago from cancer. Brio's mother was Tanamara (F547) and his father Picaron (M520). Theirs was a genuine love story. Faithful Picaron passed away in early 2012. The story ends with imagining the two wolves happily reunited. For wolves, family is everything. Sponsoring Brio and Serenity helps all our wolves. With your help we are able to keep together wolves and their loved ones. CLICK HERE to view our Events Calendar!